Well! It’s been a long time since I dusted off this old blog. As long as it’s been (9 months! ), it’s been just as long since I sewed something that wasn’t theatrical in nature. 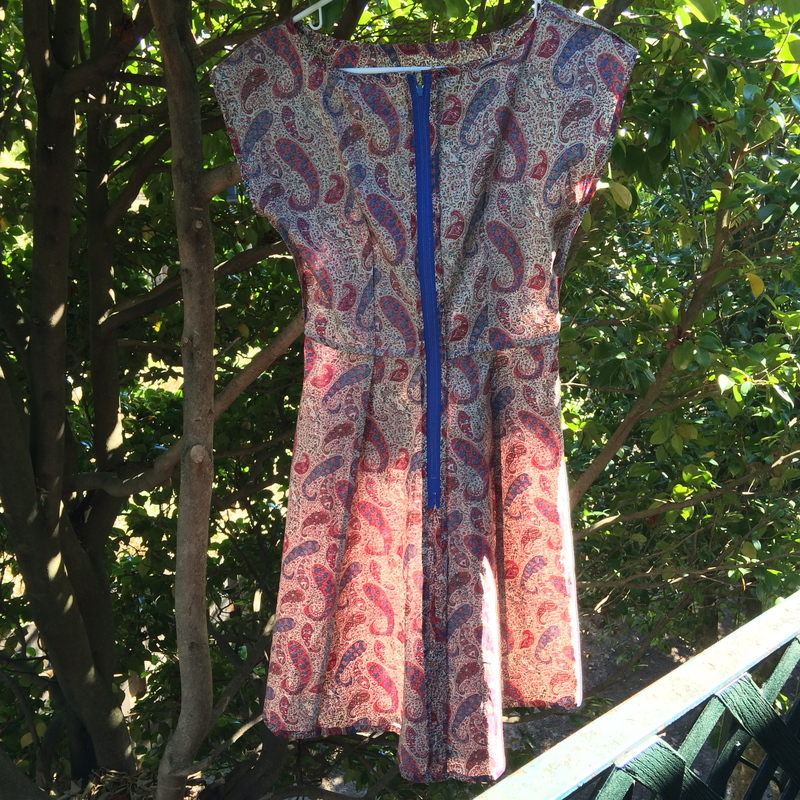 I’ve sewn dresses, vintage swimsuits, and biblical robes galore for at least three plays. I’ve altered countless pairs of trousers, I’ve taken dresses apart only to re-sew them, and I’ve torn beautiful tomato red wool to shreds with sandpaper. But, with the exception of an ill-fated tweed miniskirt that ended up several inches too large in the waist, I haven’t sewn a thing that’s meant to be worn in real life since Ryan shipped off to Morocco with a new shirt sometime around the first week of January. Until now! We had a long stretch of house-sitting in which my sewing machines languished unused, my Kenmore gave out, I purchased a new one, and I discovered that all my machines were broken!–until I realized that I’d simply been threading my Featherweight from the wrong direction. 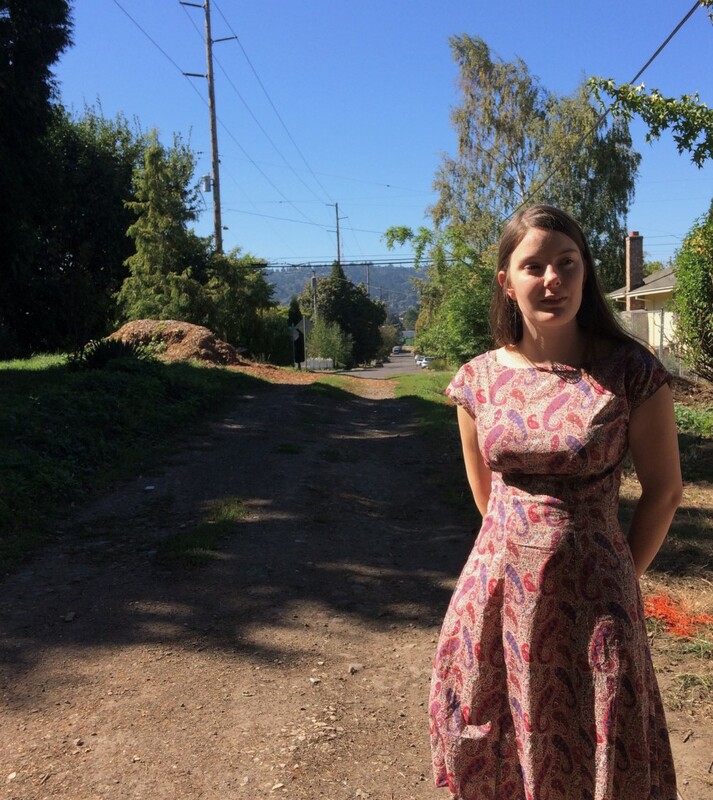 So finally, I have a dress, and it’s destined to be a hit, I think. 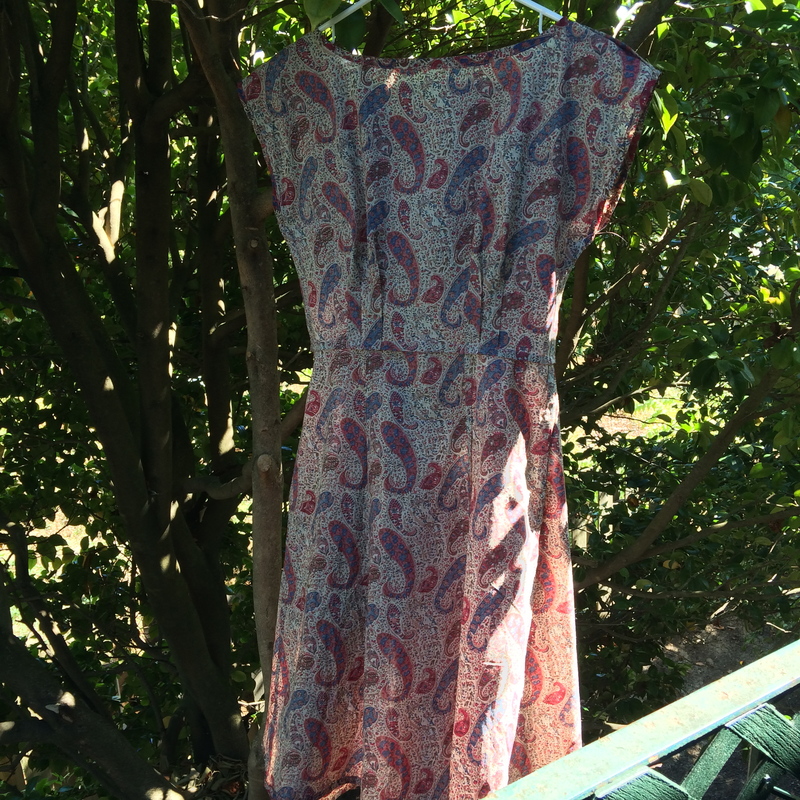 How could one go wrong with a TNT pattern and paisley Liberty? 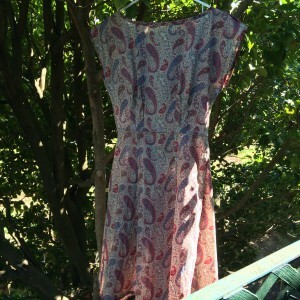 The fabric was given to me sometime last summer by my then-housemate’s mother, though why anyone would get rid of paisley Liberty I can’t think. I can’t find any information about the print, except that if I wanted, I could buy sneakers to match my dress. With a fabric this precious I wanted to make sure it was really the right garment. After wearing my turquoise Anna for most of the weekend at Pickathon, I knew I needed another. I had hopes of finishing it for my birthday, but a month later is not so bad! 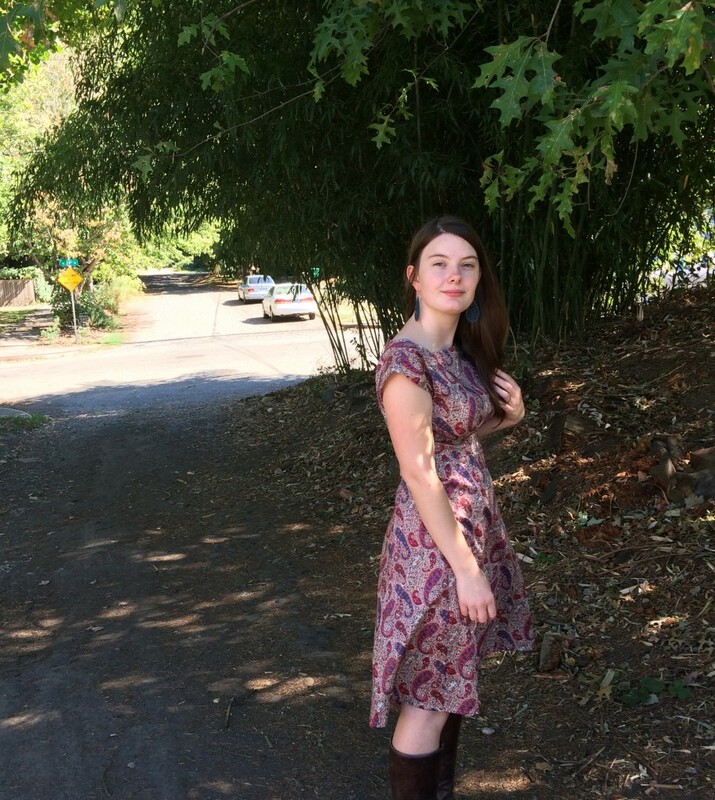 It is a perfect late summer dress, being cool enough for hot days, but the colors will go with nearly all my winter clothes and with layers I can wear it right through to next summer. The pattern is By Hand London Anna, of course. I’ve made it twice before and wear the other versions a lot in their respective seasons. I like the simplicity and the shape and have to do very few alterations to the pattern as I cut it. For this version, I shortened the pleats by 1/2″ to make a little more room for my bust and it is just about perfect now. The insides are all french seamed, except for the back seam which is bias-bound in self-bias tape (catching the edges of the zipper tape for a super neat finish!). I used the same bias tape to finish the neck and arm holes. Neck, arm holes, hem, and zipper are all topstitched, but the pattern is busy enough that it’s barely noticeable, and I have greater confidence in its durability than if I had hand sewn them. The pattern in my size used a little over 3 yards of 33″ wide fabric. I could have got it out of less if the print wasn’t directional, but I still about 50″ left, enough for little bits of lining/bias tape. So that’s that! I am back on the bandwagon, I hope! I have plans for my next two projects, both skirts. I got rid of a lot of my clothes in a panic while moving, so I am trying to slowly rebuild a grown-up and cohesive wardrobe. Here’s to layering season! 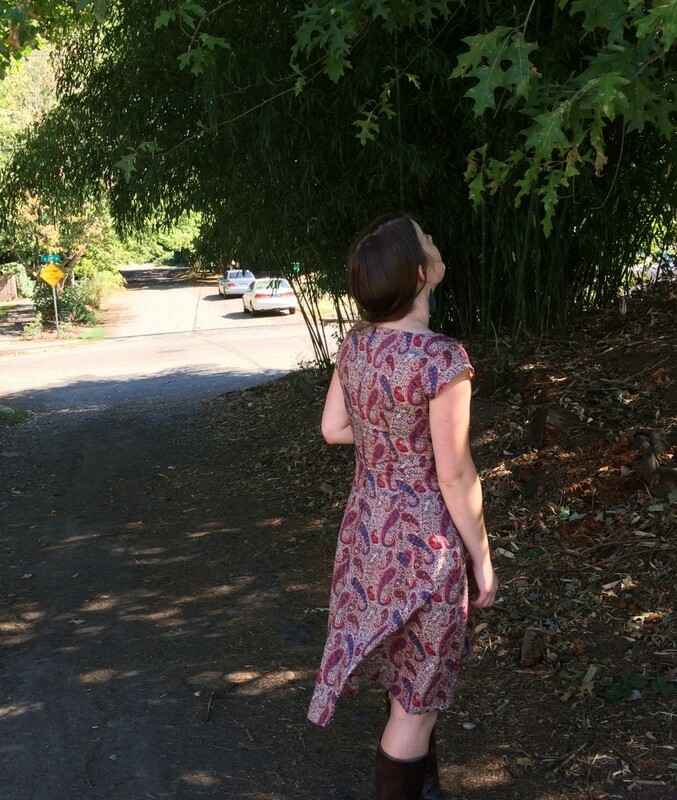 This entry was posted in sewing and tagged anna dress, dress, sewn on September 26, 2015 by Alice.